Although the bassinet makes it appear that the baby is sleeping on the main bed, a sleeping baby is quite safe and secure in the bassinet next to the bed. The baby can comfortably sleep on the co-sleeper right next to its mother and in turn, the mother can also reach out to the baby as and when needed. The Arms Reach Co-Sleeper brand Mini Co-Sleeper Bassinet is a mini co-sleeper so it can be easily slid across in small bedrooms too. In fact, it looks quite compact in rooms that have 20*24 floor space. This is a very compact product and comes with two layers. The first layer is the area where the baby is put to sleep. This has soft cotton mattresses that make the baby very warm and comfortable. The lower layer of the Arms Reach Co-Sleeper brand Mini Co-Sleeper Bassinet is a storage area which comes in a zipped fashion. This is a secured space for storing toys, diapers or any other stuff that the baby might need. This storage area is quite spacious and can store a lot of things. The whole structure is held together by a sturdy metal frame that strongly holds the baby. The parents need not fear about the baby falling or rolling over from this bed. There are also 4 extra storage pouches on the sides of this co-sleeper for storing important baby essentials. It is very easy to assemble and dismantle this structure. It comes with a covering case that can be used while travelling. The co-sleeper can be easily folded and taken in this case while travelling, so that the baby does not need to suffer in the discomfort of the hotel beds. The bed is best suited for mothers who deliver their kids through C-section as though they don’t have to wake up every time in the night to breastfeed their babies. The co-sleeper is attached very comfortably to the mother’s bed so that the mother can have an eye of the baby constantly while lying down. The product can be easily dragged along the narrow doorways because wheels are present on one side of the co-sleeper. The size is compact and hence can be easily fitted in small bedrooms. 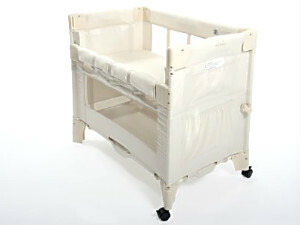 The strong metal frame is very sturdy and this can be used continuously until the baby turns 6 or 7 months old. Even after the baby grows bigger, this can be used as a storage space for all toys and toiletries. The storage container in the lower area comes in very handy while changing diapers in the night as the parents don’t have to get down from their bed. The Arms Reach Co-Sleeper brand Mini Co-Sleeper Bassinet is a very spacious product that ensures the baby gets enough air circulation. The mattresses are very soft and the insides of the bed are filled with 100% pure cotton lining that is harmless.